Aesthetics aside, minor differences are what set these two brushes apart and personal opinion will come into play. Both are excellent, but the Smart 6 just feels a little confused and lost amongst the Oral-B range. The slightly slimmer profiled handle of the Smart 5 is our preference, despite the fact that the Smart 6 does have illuminated icons for the cleaning modes. 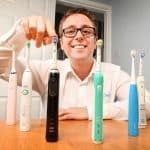 If you’re shopping for a new brush, you may also like to check out our reviews and recommendations for the best electric toothbrush. The design of the brush handles are different. The Smart 6 has a separate cleaning mode button and icons for the different modes. The Smart 6 has a Smart Ring that doubles as a pressure sensor. The Smart 6 comes with a premium travel case. The Smart 5 5000 comes with a brush head storage compartment that holds up to 4 heads whilst the Smart 6 6000 comes with a brush head stand that holds 2 brush heads. The Smart 5 5000 comes in a White/White colour configuration compared to the Silver Blue/White of the Smart 6. The Smart 5 5000 is the cheaper of the two. 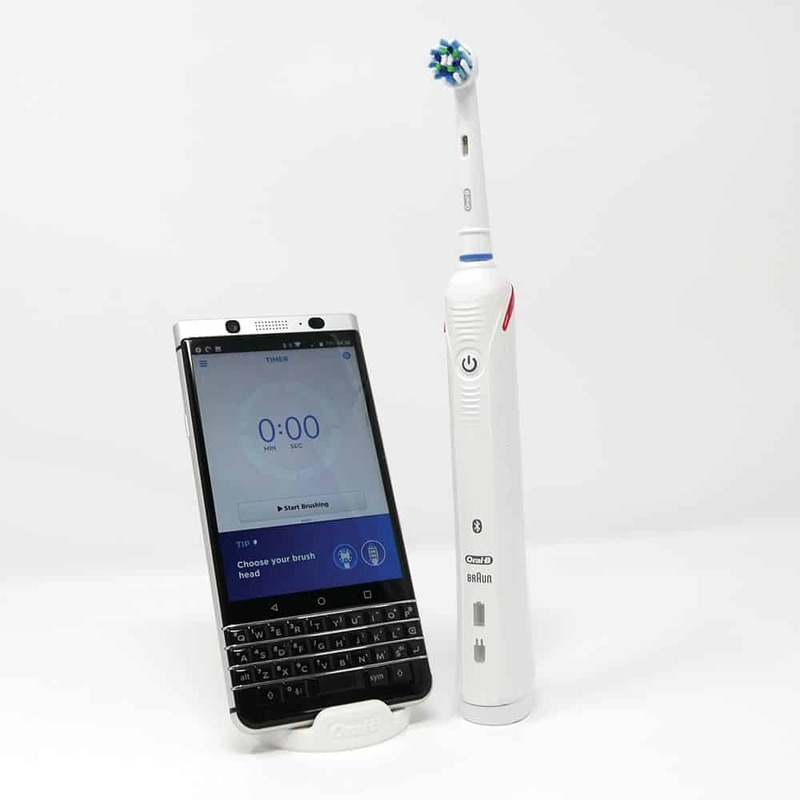 In 2017 Oral-B have launched the Smart 5 5000 and the Smart 6 6000 which we are comparing here. The Smart 5 5000 is a replacement to the Pro/SmartSeries 5000, note the extra 5 in the product name for the newer model, whilst the Smart 6 6000 replaces the Pro/SmartSeries 6000 that came before it. The primary difference between the older and new models is the battery. The older NiMH battery has been replaced with Li-Ion, doubling the battery life, amongst a few other changes too, most notably handle design on the Smart 6. A comparison of the older Pro 5000 and 6000 is available here. 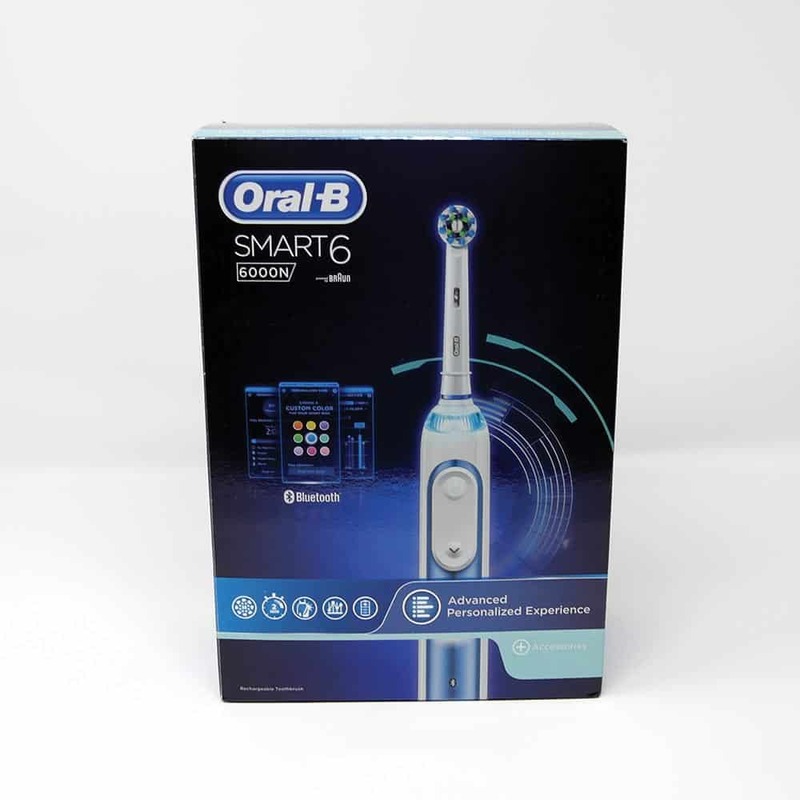 Detailed Comparison: What’s the difference between the Oral-B Smart 5 5000 and Smart 6 6000? In many respects the Smart 5 5000 feels the more premium brush even though officially the Smart 6 is. When you look at these two brushes it is clear there are some significant design differences. Both are made primarily of a plastic construction, the main body on both is a gloss White plastic. On the front of the Smart 5 5000 is a rubber grip that runs top to bottom, this is White in colour, to give the 5000 and all White colour tone. The Smart 6 6000 on the other hand as a Silver/Blue panel on the front of the handle that is plastic and sets it apart from the 5000. 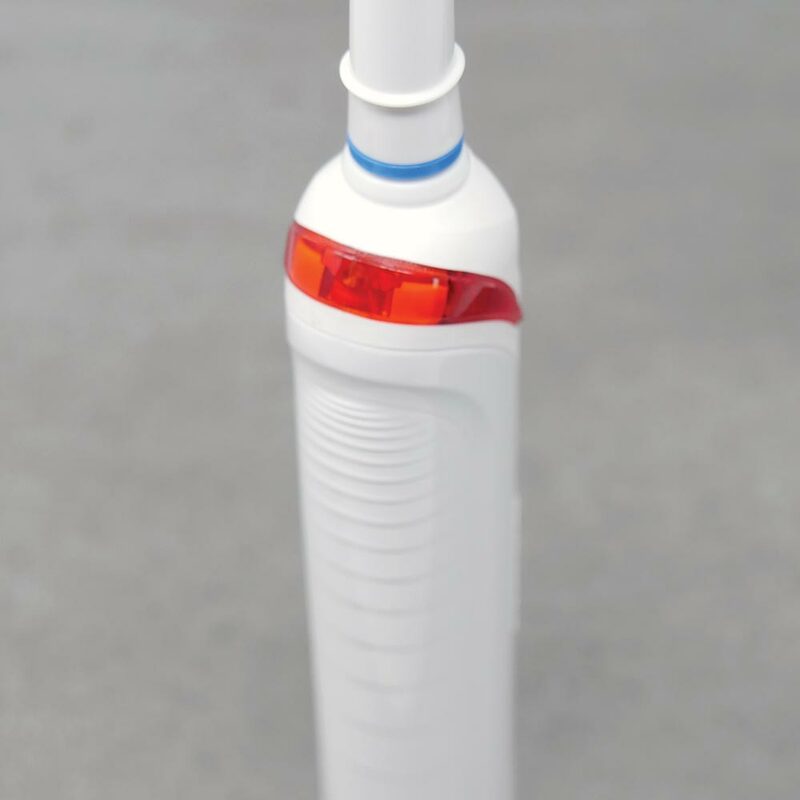 The back of the Smart 5’s brush handle is all plastic with grips from ridges in the plastic, whilst the Smart 6 6000 has a White rubber grip, all down the back of the handle. The Smart 5 has a single power button on the front, that not only activates the brush but changes the cleaning modes. On the Smart 6 there is a power button, but there is too another button, this is the cleaning mode button. You press this to change the cleaning modes. Unlike the Smart 5, the Smart 6 actually has icons that illuminate with a White light to show which cleaning mode is selected. Situated in the Silver/Blue panel this is a lot smarter and more practical than the Smart 5. However, there is no icon for the standard Daily Clean mode, which I find strange, but this is consistent amongst other premium Oral-B models. On first glance, the Smart 6 looks the more appealing. Of course it is personal opinion, but overall the very slightly slimmer profile and rubber fronted Smart 5 feels better in the hand. The brushes differ in size as follows. At the neck of the brush is where we find another difference. On the Smart 5 5000 is a Red plastic panel that illuminates when the pressure sensor is activated. This panel is primarily on the rear but sweeps into the sides of the handle. On the Smart 6, this is replaced with a ring that runs 360 degrees around the handle. This does too illuminate Red when the pressure sensor is activated, but too can be set to 1 of 12 different colours via the smartphone app. This ring then is lit that colour whilst the brush is switched on. The ring offers a bit of personalisation to the brush but in no way changes the clean. Its smart and we like the fact it can be personalised, but it brings little benefit other than perhaps a larger surface area to draw your attention too when the pressure sensor is activated. Both brushes come with a travel case, although that supplied with the Smart 6 is said to be a bit more premium. Both hold the handle and up to 2 brush heads. Both are of plastic construction and protect the handle and heads from damage and accidental activation. The case with the 5000 is transparent and rounded in shape whilst the case with the Smart 6 is all White in colour and although rounded has a flatter profile, it does too feel a little more robust. We prefer the case with the Smart 6 6000 but the one provided with the 5000 is perfectly functional. In the box with the Smart 5 5000 is a really great brush head storage compartment. A tray that holds up to 4 different brush heads, there is a transparent lid that closes over the top but will also allow air to reach the heads and dry them. With the more premium 6000, instead of this tray you get a brush head stand, a moulded piece of plastic that clips around the charging stand. It has 2 prongs on it, on which up to 2 brush heads can sit. It does provide a home for spare heads but they remain exposed and it feels poor in comparison to the Smart 5. Not a major difference, but perhaps noteworthy is that in our hands on testing the Smart 5 achieved 16 days usage time (based on 2 cleans of 2 minutes per day) whilst the Smart 6 achieved 18 days. Officially Oral-B suggest both brushes have a battery life of 2 weeks. Aside from the aforementioned differences, the brushes are the same. The same motor powers the brushes and both have timers and pacers built in. Both have Bluetooth connectivity, come provided with a smartphone stand, come with additional brush heads, a 2 year warranty and a water resistant brush handle. No. Both brushes have the same motors, the same cleaning modes and performance. It will all come down to the user and how they use the brush. Both are a significant step up from a manual brush and all will give you healthier teeth and gums as a result of use, if used with the correct brushing technique. Yes, the Smart 5 5000 is the cheaper of the two. More often than not, there is not a great deal between the two though. At the time of writing the Smart 6 is £90 compared to the £78 of the Smart 5. Always subject to change is the price, with some retailers, particularly those online being a little more aggressively priced more often. We opt for the Smart 5 5000. There are arguably some benefits to the Smart 6, most notably the icons that actually allow you to see what cleaning mode you have selected. However, in day to day use, the slightly slimmer profile and the included brush head compartment win out in our opinion. It is a tightly fought race and we would not fault you for going for either of these, weigh up what is more important. 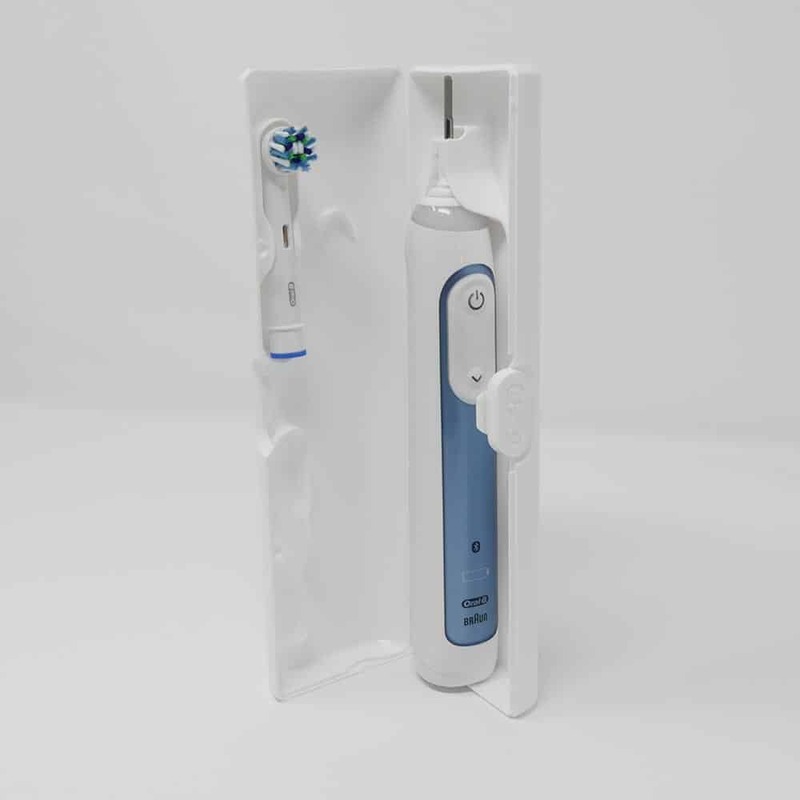 Either will give your teeth a great clean and allow you to be at the cutting edge with Bluetooth connectivity and tracking. not showing the active cleaning mode turned out to be huge showstopper. My kids needs the lower speed as advised by their dentist. So they need to see what mode is active. You can’t ask a 7, 10 years-old to count how many times they press the button to be sure of the mode. It’s even worse when the persons brush their tooth one right after the other. They could pick a different mode and you don’t what to do next. My 5000 didn’t reset to the default mode after I shut it off. I took a 6000 instead, turned out it was even cheaper than the 5000 on amazon UK. (note to readers: amazon UK is about 15 to 30% cheaper on all models compared to Amazon FR, DE). At least Brexit brings one good news to continental shoppers: cheap £/€ rate = cheap import from the UK. the only bad thing with the 6000 is the lack of Storage compartment for 4 heads. @Braun, how have you made that foolish decision? Luckily, I had kept one from an older model. I think this is very desirable. The normal mode is the one without illuminated icon. it’s only when you activate an alternative mode that you need an illuminated icon. It’s actually even better like that. When I turn the brush on, I don’t want to check which icon is on. If I don’t see an icon, I already know I’m good to go because no icon = normal mode. Thanks for the comment and sharing your opinion, this is helpful for me and other readers of the site. Do you think the Smart 5 or Smart 6 would work with the 3471 version of the smart glide too? I don’t think it will Shane, but then I didn’t think that the Smart 5 would work with the 3472. My 3471 guide has broken. I have another on its way. If you can allow me a few days for it to arrive and test and I will come back with full info. I can confirm that the Smart Guide 3471 (old style) does not work with any of these models. I have tested. Thanks for the comparison above, it is very useful indeed. I am a huge fan of the smart glide which came with older models rather than using an app on my phone and I have a 3741 version. Someone mentioned in a post on your Genius 9000 review that only the 3742 version would work, is this the same for the Smart 5 5000 and Smart 6 6000 models too? It is the 3472 wireless smart guide that works with the Genius 90000. When I tested the Smart 6 6000 it did not work. I will look to test with a Smart 5 soon and will report back if it does work, but I suspect the answer is no, it will not. Shane, I take back what I said in my previous comment about the Smart 5 not working. Just tested and it began working with the 3472 Smart Guide straight away. This is odd, because when I tried the Smart 6, it did not work…. I am going to do some more testing and get back to you.